I entered the Pattern Review, Fitted Blouse contest back in March and sewed the McCall pattern M5433 AA. Had a bit of computer problem uploading photos, which makes it challenging to blog, so I gave it a break tried a few times over the past months still not working, until I tried it again today, and what do you know, it is working, the universe is great. 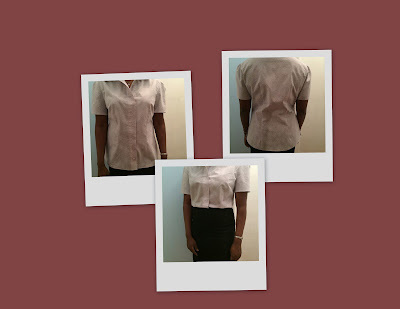 My blouse is a bit more looser, because I went a size bigger, I was worried about the fit, I also machine sew the hem to save time. I would definitely sew this pattern again and more true to my size.